Spotlight on Secret Wars #9: And so it comes to an end. I went into the final issue of Marvel’s universe-shattering event with hope for something satisfying to close things out, but it was a slim hope. I should have known to trust Jonathan Hickman to put a strong finish together not just for the Secret Wars event, but his entire tenure at Marvel, and the Marvel Universe itself. 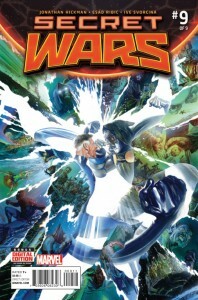 I’d rather not spoil the story here and this is not a review per se, but in the broadest terms terms Secret Wars #9 succeeds in delivering the end of every thing. Anyone following Marvel Comics in general or this story specifically knew that it was going to require an epic story to cap things off. Hickman managed to boil it all down to where his Marvel work began: Reed Richards and Victor Von Doom. I’m not a huge fan of either character, but I found myself buying in completely. Spotlight on Uncanny X-Men #1: As disappointed as I am with All-New All-Different Marvel generally, and the newest crop of X-titles specifically, there’s no way I’d pass up the debut of another volume of Uncanny X-Men. 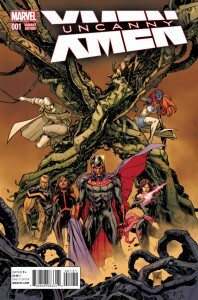 The hook for this latest relaunch is that the team is populated primarily by villains and antagonists like Sabretooth, Mystique, and their leader Magneto. While I’m unclear on what’s motivating these characters to stand together as heroes, there’s potential given writer Cullen Bunn’s success with his recent Magneto solo series. Bunn has a reputation for doing good things with the bad guys and he has a lot of badness to work with here.